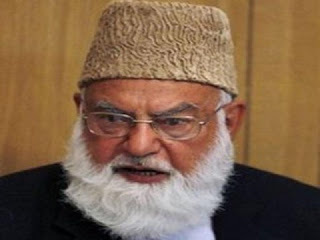 Today is a sad day for the politics of Pakistan because one of the most honest and experienced politician of Pakistan and former Ameer of Jamat E Islami Qazi Hussain Ahmed has passed away on Saturday night. inna lillahi wa inna ilayhi raji'un. According to media reports Qazi Hussain Ahmed was a patient of heart and also having problem in taking breath from some days due to which he has died. Qazi Hussain was born in 1938 in Nowshera. in student life he was active member of Islami Jamiat-e-Talaba and later on he joined Jamat E Islami. in 1987 he became head of Jamat. in 2010 he stepped down as head of JI due to his bad health.